Trees, like people, have a natural lifespan. Through mentorship, tree planting activities, and education about the importance and care of trees, Waitsburg youth will ensure that Waitsburg continues to enjoy the beauty and environmental benefits of lush established trees. 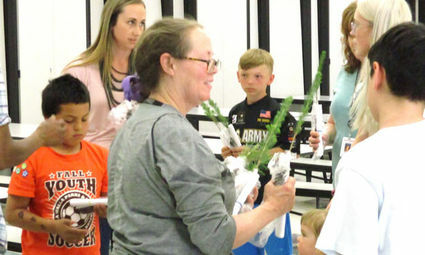 On Arbor Day in 2018, every child at Waitsburg Elementary received a evergreen seedling to plant, along with planting and care instructions. You can read the article about the Arbor Day event in The Times. Allison Bond and the kids of Waitsburg Elementary. Photography by Emma Philbrook. Tiny trees awaiting planting at the 2018 Arbor Day event at Waitsburg Elementary. Future activities will include a tree planting guide for the city of Waitsburg, a heritage tree map as a walking guide to Waitsburg's oldest and most distinguished trees, and a photo library of Waitsburg's heritage trees.